Happiness and positivity are essential to every aspect of getting the most from life after 60. This is why we are always searching for ways to be happier. When we feel happy, we are more likely to get out and engage with the world – and the more we do, the happier we become. Do you agree? Unfortunately, many of the things that can make us happier require a long-term commitment. Getting in shape takes time. Learning to meditate, while valuable, requires patience and self-control. Following someone’s advice to “just get out there and make friends” sounds easy, but, it really isn’t. So, if you feel like you’re not reaching your happiness potential, it’s hard to know where to start. Are there Really Simple Ways to Be Happier After 60? Yes! 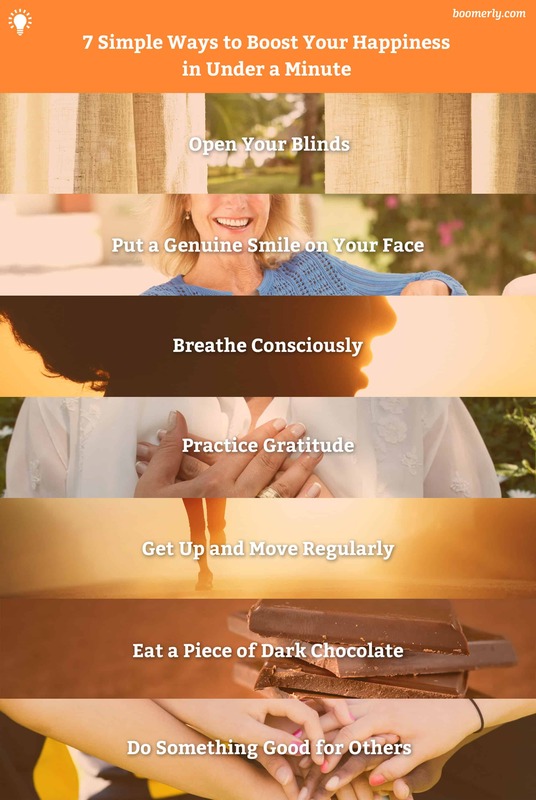 In fact, there are several simple ways to boost your positivity in under a minute. None of these suggestions will change your life. But, in combination, they may be enough to get you started on the road to happiness. You’ve probably heard about SAD (seasonal affective disorder), in which a lack of sunlight can lead to sadness, or even depression. But, even if you don’t suffer from this condition, opening up your blinds and letter a little sunshine into your home can give you a happiness boost. Even better, why not go for a quick walk in your garden? The extra sun will get your brain buzzing, while the walk gets your heart pumping. It’s true that smiling can give you a happiness boost, but, this is only part of the story. Have you ever noticed that genuine smiles look different than forced smiles? Your brain knows the difference too! So, instead of forcing yourself to put a smile on your face, think about what it feels like when you are happy. Conjure up a happy memory and watch your smile grow. You will feel the difference. Chocolate is not just a sinful little treat – it can also make you happier! Chocolate contains chemicals called polyphenols, which have been shown to have happiness boosting properties. Just make sure that you choose dark chocolate (over 70% cacao) to get the benefits of chocolate without the downsides. One of the most effective ways to boost your happiness is also one of the simplest – breathing. In a world filled with buzzing phones and blinking instant message screens, sometimes we need to return to the basics. Controlled breathing can lower your blood pressure and put your body and mind in a state of calm and relaxation. Find out more about the connection between breathing and happiness. For most people, negative thinking comes naturally. Positivity, on the other hand, requires conscious effort. One of the simplest ways that you can train your mind to focus on the positive is to write down what you are grateful for. So, take a minute right now and write down 3 things that make you happy. According to Dr. James Levine, “Sitting is the new smoking.” In a recent interview with the LA Times, he also said that low activity lifestyles have been linked with weight gain, diabetes and other health problems. In a perfect world, everyone would go to the gym 5 times a week and eat perfectly balanced diets. But, even getting up once an hour, stretching and walking around the house is a great start. If you’re serious about your health and happiness, why not set an alarm to remind yourself to get moving every hour? Doing good for other people is a simple way to increase your happiness. You don’t even need to donate money to charity or join a cause that you care about (although you probably should!) Even giving a genuine compliment to a friend or helping an elderly neighbor to collect her shopping is enough to make you feel more positive. What other activities have you found give you an instant happiness boost? Do you watch funny movies, listen to your favorite song or call a friend? I’d love to hear what works for you. Please join the discussion.